Continuous Process Improvement. Operational Excellence. There’s no question that the tools associated with Lean Six Sigma, CPI and Operational Excellence can help any team or organization streamline operations by reducing waste and eliminating defects. Targeted process improvement efforts are undeniably valuable to customers, employees and stakeholders alike. But the real impact comes when an organization moves beyond “tools and projects” and incorporates the principles associated with Lean Six Sigma into the culture. 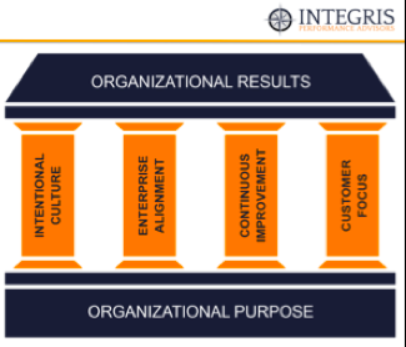 At Integris, we use the Four Pillars framework to help guide organizations on how to embrace these principles to create the healthiest culture possible. Read more about it here. The Four Pillars® offers a highly effective framework for structuring holistic organizational change efforts. The Four Pillars model helps to establish an organizational culture in which the values and behaviors are aligned with the guiding principles of Lean Management, in which employees are engaged, customers are delighted and stakeholders are satisfied. Building an Intentional Culture is about defining, cultivating and reinforcing the behaviors the organization wants to see from all team members, the senior leaders to front line workers. Creating a common language about what's desired - as well as what is not acceptable - is the quickest way to get on the path to organizational health and operational excellence. For process improvement efforts to be successful, there must be clarity around the vision, mission and values of the organization. Goals and metrics must be transparent, aligned and interconnected, from the strategic plan down to departmental, team and individual levels. Doing so ensures that every employee - top to bottom- understands what the organization is looking to accomplish, and how their individual role contributes to the achievement of that vision. There is always room for improvement. Focused improvement efforts result in long-term, sustained changes when they are coordinated and standardized. Lean Six Sigma provides a proven suite of tools and concepts for increasing efficiency and enhancing effectiveness that enables people at all levels to come together - across departmental and functional lines - to work as a team toward the achievement of organizational goals. Organizations must be clear about who the customers are and what they expect. Accurately defining customer requirements sets the stage for delivering the highest levels of customer satisfaction. Staying in touch with those requirements through Voice of the Customer feedback mechanisms enables organizations to keep a finger on the pulse of the business and quickly recognize when customer desires have changed or evolved.